Cardo makes some of the best communication systems for motorcyclists. We’ve discussed and reviewed the company’s products in the past. Recently, the company reached out to us to let us know that it opened preorders for the new 45mm Audio Set. Cardo and JBL teamed up to produce what the companies call “the highest quality audio experience for motorcyclists.” We’ll have to test that before we can believe that claim, but JBL’s quality is well-known and with Cardo’s communication systems being what they are, we wouldn’t be surprised if the 45mm Audio Set was legitimately a high-quality piece of technology. The set will work with Packtalk and Freecom systems. It provides users of those products with JBL’s cutting edge Sound Processing and Equalizer Sound Profile technologies. The sound processing part of the technology helps make the sound appropriate for the 45mm setup. The equalizer sound profile tech lets you customize the audio settings. You get three different sound profile settings: standard, bass boost, and vocal. It’s pretty obvious what each does from the names. 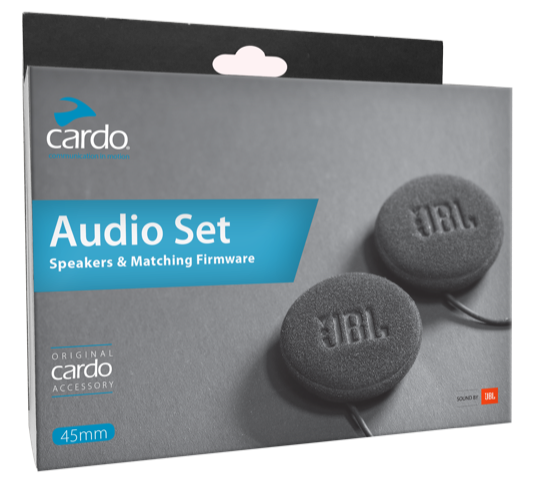 If you want to be among the first riders with the new JBL audio set, you can head over to Cardo’s website and take advantage of the preorder availability. Are these JBL speakers really $90 better than the stock speakers from last year? I guess that I’ll just wait for the review and the street price once Cardo starts shipping to retail stores.